Dark chocolate. Ahhhhhhh! Our true love. Technically speaking, dark chocolate simply has a higher percentage of chocolate liquor. That sounds like a confusing term, “chocolate liquor”, but it simply means chocolate nibs which have been ground into a paste. This means it incorporates cocoa solids and cocoa butter with the nibs. The result? Yummmm! Here in the Cocopotamus chocolate kitchen, dark chocolate is our go-to chocolate for we like our chocolate flavors more complex with a deeper body and flavor. We use almost all exclusively dark chocolate ranging from from 50% to 88% in our chocolate truffles. However, we do make a milk chocolate truffle (enrobed in dark chocolate for a more contrasty flavor...we can't help it! ), and a mellow salted caramel fudge truffle (Cowgirl). 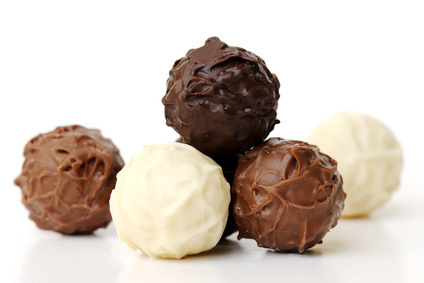 Most of our dark chocolate truffles in our chocolate collection are between 63% to 65% dark. For those who really, really love gourmet dark chocolate? We do make one Cocopotamus flavor which is extra dark. It is our “Bo Peep”, an 88% dark chocolate fudge infused with a hint of organic black raspberry from the Pacific Northwest. Believe it or not, it wasn’t until the year 1873 when milk and chocolate were combined. (What took us so long?!) Though at Cocopotamus our true love is dark chocolate, we must admit that this was a heavenly combination. Smooth, creamy yet still chocolate, or rather chocolaty; good stuff! The first blend used 20% milk solids paired with chocolate. The mix merged well on the molecular level: the fats and proteins of chocolate combine well chemically with those in milk. Though we mostly use dark chocolate for our truffles here in the Cocopotamus chocolate kitchen, one of our most popular flavors, Holy Cow, is made with milk chocolate. Though dark chocolate remains our first passion, this newbie is a milk chocolate fudge which we hand-dip in dark chocolate. The milk chocolate fudge is creamy, smooth and not too sweet. Moo! If we get technical about it, white chocolate isn’t truly chocolate at all. To be a true chocolate it would need to contain cocoa butter and cacao. White chocolate does not contain any cacao solids; that explains why it lacks that quintessential chocolate color and taste! Having said that, their are many fans of white chocolate. Or, “chocolate”! Here in the Cocopotamus chocolate kitchen, we use white chocolate for decorative purposes. It is one of our favorite ways to get creative. For example, our popular is topped with a “frosting” of white chocolate and naturally colored sugar sprinkles.